This website is run by a collective of tour guides who are addicted to the flea market. As Parisians, we have a passion for rummaging through the Flea Market, and we want everyone to have the same chance, irrespective of language and culture barriers. 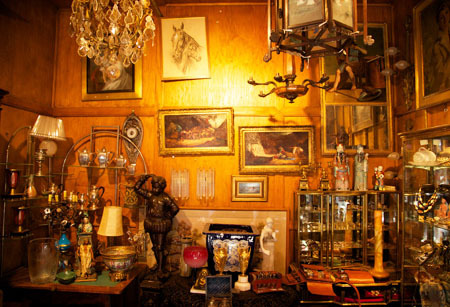 We are committed to running walking tours of the Paris Flea Market every market day, year round. As independent, professional tour guides, we are not affiliated to any antique dealers, we do not receive commissions from any of them etc., our income comes exclusively from the sales of tickets to our walking tours. We run small group tours, where you join a handful of like-minded visitors, and private tours, where you have the guide all to yourself. Our goal is to expose our guests to the full range the Flea Market presents, and to give visitors the tools to comfortably shop and explore all on their own. The Paris flea market is the largest antique market in the world. It comprises some 2,500 stores, spread across 15 markets. The term “flea market” is said to have been coined for the Paris flea market – selling rags and old clothes ‘with fleas included’. Of course the market has come a long ways since then.